No. in. There's nought but care on ev'ry han. 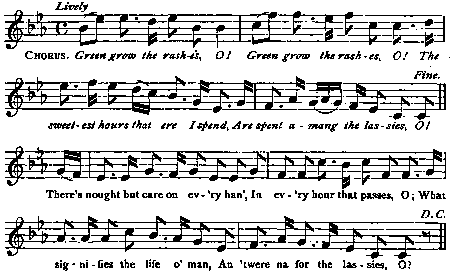 Tune : Green grow the rashes, O Scots Musical Museum, 1787, No. 77. An' tho' at last they catch them fast, Their hearts can ne'er enjoy them, O. The wisest man the warl' saw, He dearly lov'd the lasses, O! Her prentice han' she tried on man, An' then she made the lasses, O.